The English Sweating Sickness was a very serious disease, and could kill a person displaying symptoms within as little as three hours. One of the symptoms was profuse sweating. An outbreak of the disease in 1528 was particularly deadly, and even reached onto the Continent. It is still not entirely known what exactly the Sweating Sickness was. A person did not die within the first twenty-four hours of showing symptoms, he or she was very likely to survive. The disease frequently infected the young and wealthy, and it is unknown how the disease spread. Given that the outbreaks typically occurred in the spring and summer, insects were likely vectors. It seems that Anne Boleyn herself was terrified of falling ill, and that the distance from Henry for an unknown length of time was eating away at her. Luce, John W. and Company, with designs by Florence Swan (1899). 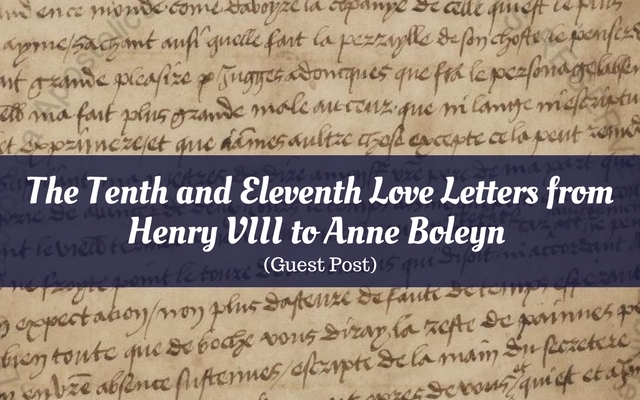 Love Letters of Henry Eighth to Anne Boleyn. Pp. XXV-XXVII. Boston and London: John W. Luce & Company (1906). Henry had resumed some of his regular pastimes, including hunting. Those are provocative words coming from the King of England. What interesting contents in this letter; first, a bold flirtation, then second, talking about Anne’s sister. One must wonder how Anne Boleyn reacted to the hasty change of subject. Luce, John W. and Company, with designs by Florence Swan (1899). Love Letters of Henry Eighth to Anne Boleyn. Pp. XXVIII-XXIX. Boston and London: John W. Luce & Company (1906). The Editors of Encyclopaedia Britannica. “Sweating Sickness.” Encyclopaedia Britannica, Inc. Published 5 July 2017. https://www.britannica.com/science/sweating-sickness Accessed 10 February 2018. Weir, Alison. Mary Boleyn: the Mistress of Kings. New York: Ballantine Books Trade Paperbacks (2012). See more work by Darsie at Maidens and Manuscripts!